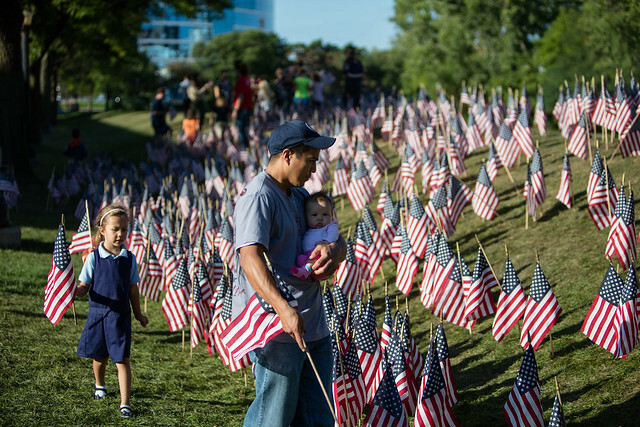 On September 11, 2018, the Foundation and Museum were honored to host the 17th Annual September 11th Community Day of Remembrance/Scout Salute at the Gerald R. Ford Presidential Museum. The event went from sunrise to sunset to honor those who lost their lives on September 11, 2001. In addition to the Scout Salute, there were ongoing family-friendly events throughout the day. There was a police dog demonstration as well as horses from the Mounted Unit of the Kent County Sheriff’s Department. A blood drive was held inside the Museum and several pints of blood were donated! The evening program featured Brigadier General Michael C. H. McDaniel as the speaker. The event closed at sunset with the final salute of the day.